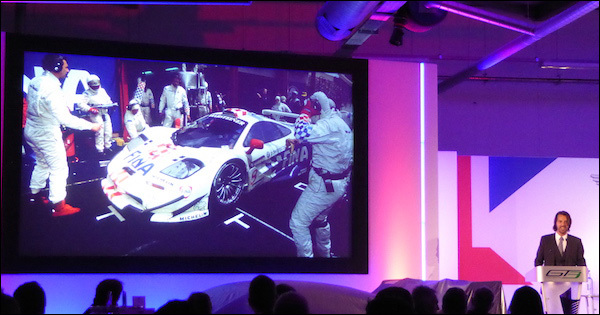 Stephane Ratel was the keynote speaker at the Bentley Motorsport end of season party in Crewe and the SRO founder and head had plenty of interest to say on the present and future of the GT racing scene in a fascinating presentation. A review of the journey from one make Venturi racing in the early 1990s through to the present day GT3 (and GT4) scene was the order of the day but in amongst the reminders of GT racing’s recent past were a few snippets of what might be to come, and some interesting analysis of where things stand today. 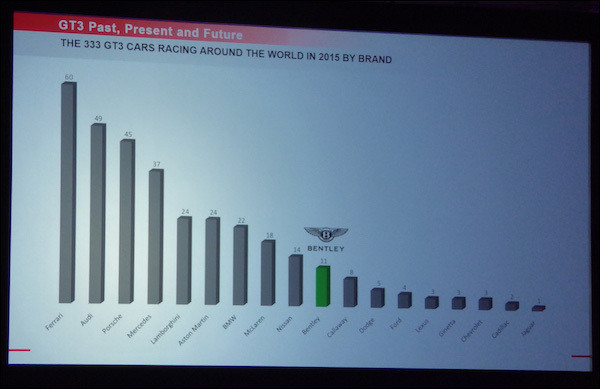 That shows the Ferrari 458 as the most raced GT3 spec car of the season with no fewer than 60 active cars, Ferrari one of an astonishing 18 active marques. 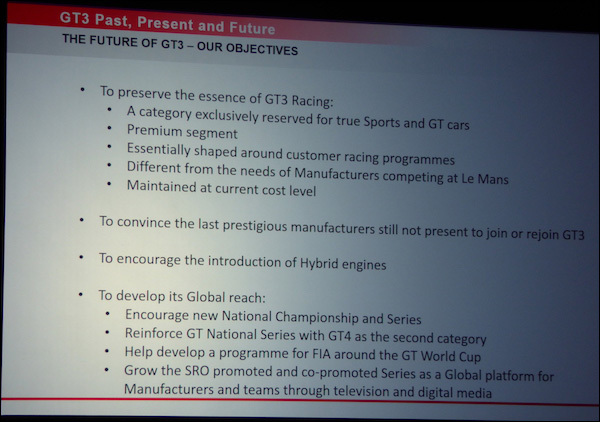 And one potential route forward for both potential newcomers and newer models from existing GT3 contenders comes with the aspiration from SRO that hybrid engines/ powertrains feature in near future regulations. As for the global aspirations of SRO, the plans for an Intercontinental GT Challenge are well known with the Spa 24 Hours, Sepang 12 Hours, Bathurst 12 Hours and the new event at CoTA, a three-hour endurance race on the bill of the Pirelli World Challenge event in March combining to give a four-race series aimed at GT3 manufacturers, though the Bathurst race’s Pro-Am format continues to cause some issues. Stephane Ratel also added that a potential expansion of the Challenge to Africa was under investigation with his organisation evaluating the potential for an organisational and promotional input into existing events in South Africa.